It's Bike to Work Week! Photo by sportpictures. 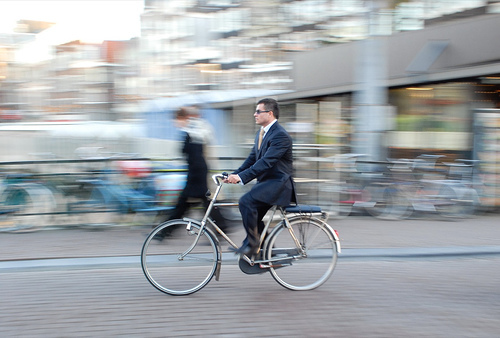 It’s National Bike to Work Day in the United States! Check out events in cities like Washington, D.C. And listen to this NPR interview about how cyclists and drivers can learn to share the road. “Scraper bikes” are changing life for kids in Oakland, Calif., as shown in this video report. New York Health Commissioner Thomas Farley isn’t afraid of biking on city streets anymore – he’s now cycling to work and encouraging others to do the same. “Most people don’t have time to exercise. But people have to get around and biking is an ideal form of transportation,” he said. High particulate air pollution in urban areas may contribute to higher blood pressure levels observed among city residents with high exposure compared with people living in less polluted areas of the city, according to researchers from the University of Duisburg-Essen in Germany. The Ford Foundation announced a five-year, $200 million effort to help transform cities through integrated housing, transportation and land-use policy to foster greater economic growth. From OnEarth magazine: More cyclists are taking to city streets. “Ride the City” iPhone app helps them find the way. The San Francisco Municipal Transportation Agency (SFMTA) completed the first-ever count of all the publicly available parking spaces in San Francisco, and now developers have created a new app through the SFPark pilot project to make it easier to find a place to park.